The Penang Development Corp (PDC) and YTL Land & Development Bhd yesterday signed an agreement to develop luxury apartments on a 1.38ha land in Lebuh Farquhar in Penang. Each party will hold 50 per cent equity in the project and they could start anytime soon, Penang Chief Minister Lim Guan Eng told reporters after the signing ceremony yesterday. PDC was represented by general manager Datuk Rosli Jaafar while YTL Land by executive director Datuk Yeoh Seok Kian. A hotel was originally to be built on the site by PDC Heritage Hotel Sdn Bhd, a joint venture between YTL Hotels & Properties Sdn Bhd (a wholly-owned subsidiary of YTL Corp Bhd) and PDC. After the project was shelved due to the economic slowdown, PDC Heritage Hotel sought to change the type of development from hotel to luxury apartment. Subsequently, it applied to change the type of landholding to freehold and the condition of land use to residential and business. "The state government approved PDC Heritage Hotel's application on June 3 2009 subject to three additional conditions," Lim said. He said the building height must follow the Unesco guidelines which was not more than five storeys and all costs pertaining to condition changes which exceeded RM8.2 million must be borne by YTL Hotels. Finally, PDC's equity must increase by 1 per cent from 49 per cent to 50 per cent and the cost is fully paid by YTL Hotels, he said. SARAWAK Housing Development Corp (SHDC) plans to develop a 143.2ha state land at Muara Tebas, about 40km from Kuching, into a mixed project. To be named "Bandar Baru Muara Tebas", the proposed development will feature residential units and a shopping area with 64 units of three-storey shophouses, restaurants and food courts. It will also have community facilities such as a community centre, a primary school, a kindergarten and a mosque. Housing and Urban Development Minister Datuk Amar Abang Johari Tun Abang Openg, who visited the site yesterday, said the residential portion will comprise 1,035 units of affordable houses, 449 units of two-storey terrace, 286 semi-detached houses and 64 two-storey bungalows. "The attraction (of the property) is the lake, the size of four football fields, and a central park, both of which will serve as the focus of the scheme, aimed at enhancing the aesthetic value and environmental quality of the project," he said. Abang Johari said the lake will have facilities for small craft like yacht and tourist boats to anchor. Bandar Baru Muara Tebas will serve as an extension of Kuching city, with the characteristics of a resort town. He added that Muara Tebas, which is presently a small village, is set to become an important residential suburb of Kuching over the next decade. "The development project is expected to be completed under the 10th and 11th Malaysia Plans," he said. He said his ministry will seek federal funding for the project, but declined to reveal the cost. Earthwork on the site, costing RM2.6 million, is expected to be completed by February next year. "Once the earthwork is completed, we will start constructing 192 units of affordable houses under Phase One of the project," he said. PETALING JAYA: Ireka Corp Bhd expects its proposed high-end residential project in Kuala Lumpur to contribute to earnings by financial year ending March 31, 2012, said chairman Abdullah Yusof. “Assuming we can launch the project in early 2011, it should begin contributing to revenue in our 2012 financial year,” he told StarBiz in an e-mail. Earlier this month, Ireka announced it would co-develop with London-listed Aseana Properties Ltd (APL), on a 30:70 basis, a high-end residential tower at Jalan Kia Peng. The project, which will be next to the Kuala Lumpur Convention Centre, is expected to generate a gross development value (GDV) of RM272mil, with a gross profit margin of about RM58mil. Abdullah said the estimated GDV of RM272mil was based on a conservative assumption and the amount would definitely increase by the time the project was completed. “Indeed, we expect that the GDV will eventually increase, as the world economy stabilises and when the momentum of the real estate sector returns. Our current GDV estimate is based on today’s price,” he said. Ireka currently has no immediate plans to acquire more residential land at the KL city centre (KLCC) area. “However, like all ongoing business concerns, we will continue to evaluate good opportunities that come our way,” Abdullah said, adding that he was optimistic about the outlook of the local property sector. “We see confidence slowly returning to the property sector in Malaysia. “The volume of transaction is still relatively low but we expect this to pick up by 2012, and we want to be there when the property market takes an upturn. “Nevertheless, the group needs to proceed with a certain degree of caution going forward. “As for properties within the KLCC area, we strongly believe that this area will be the most prime address in Kuala Lumpur,” he said. Meanwhile, Ireka Corp’s wholly owned subsidiary, Ireka Engineering & Construction Sdn Bhd, has been awarded a RM52mil sub-contract by Transmission Technology Sdn Bhd for the proposed offices and hotel development project in Kuala Lumpur. The sub-contract would be completed in two phases, the company told Bursa Malaysia yesterday. DENPASAR, Bali: Tune Hotels.com will invest RM50mil to RM60mil in land and building acquisitions from now until the first quarter of next year. Group chief executive officer Mark Lankester said the investments would involve the opening of 10 new Tune Hotels in seven countries in Asia and in Britain. “People may say we are ambitious but we are on track to meet our targets,” Lankester said at the launch of the 170-room Legian hotel in tourist-saturated Bali yesterday. The company launched its first two regional hotels outside Malaysia in Bali in a span of months. Its 139-room Kuta hotel was launched on Nov 6 at an investment of RM20mil, while the Legian hotel involved an outlay of RM22mil. Calling itself “a limited service hotel brand providing a five-star sleeping experience at a one-star price,” Tune Hotels.com has effectively set itself aside from other budget hotels and hostels. In this holiday season in Bali, the average room rate at other hotels is RM300 a night. If one were to book online way in advance, the rate is about RM20 a night. A walk-in rate varies according to demand and occupancy. Yesterday’s walk-in rate was RM75.50 a night. “There are two kinds of backpackers – the first are professional ones who travel five to six times a year and who want to stay in a dormitory and share the bathroom facilities. “The second are those who pay for their rooms with a gold credit card, and whose parents are professionals. “The en-suite facilities that we offer – every room comes with a bathroom – together with the various other support services like a 24-hour convenience store, simple food and beverage facilities and transport counter will appeal to this group,” Lankester said. The two Indonesian hotels join five other operational Tune Hotels.com locations in Malaysia – in Penang, Kota Kinabalu, Kuching, Kuala Lumpur and KLIA-LCCT Airport. 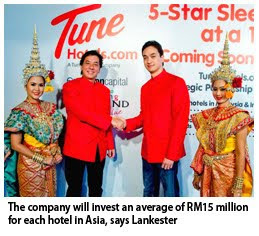 Tune Hotels.com’s reach will subsequently be expanded to Jakarta, Bandung, Surabaya, Yogyakarta, Batam and Medan soon. Tune Hotels.com employs a self-service online booking system that encourages guests to book as far in advance as possible on www.tunehotels.com to enjoy exceptionally low prices. Rates are kept low by employing a “limited service” concept where under-utilised hotel-operated facilities like pools and gyms are removed and cost-savings are passed on to guests. 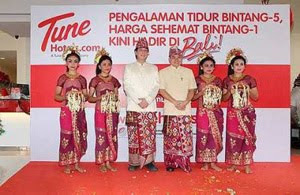 BALI: Tune Hotels.com plans to add 24 new budget hotels in Indonesia by 2015, including Jakarta, Medan and Bandung, to capture a pie of the republic's lucrative tourism market. Group chief executive Mark Lankester said the new hotels are part of the no-frills hotel operator's plan to open 100 hotels all over Asia in the next five years, in line with its shareholders' plan to open one budget hotel at every city that budget airline AirAsia flies to. Tune Hotels.com's shareholders include Datuk Seri Tony Fernandes of AirAsia. "We will invest an average of RM15 million for each hotel in Asia, depending on the number of rooms," Lankester told reporters at the opening of TuneHotels Legian, its second hotel in Indonesia, here yesterday. In the first quarter of next year, the hotel chain will invest RM50 million to buy land in Jakarta, Medan, Bandung as well as the UK, Phnom Penh, Melbourne and Perth. "It takes up to 12 months from buying land right up to building the hotel," said Lankester. He said the company also has received enquiries to start up operations in Japan, the Middle East, France, India and is looking for land in Singapore. Tune Hotels.com signed an agreement with Thailand's Evolution Capital Public Co Ltd last Saturday to jointly open 44 hotels across Asia with an investment of US$200 million (US$1 = RM3.44). The 44 hotels are part of its plan to open 100 hotels across Asia, of which five are already operating in Malaysia. KUALA LUMPUR: Malaysia Pacific Corporation Bhd is eyeing more joint-venture projects to fund its RM4 billion development project, namely the Asia Pacific Trade & Expo City (APTEC) and LakeHill Resort City. Located within Iskandar Malaysia, the project is due for construction next year, said President and Chief Executive Officer Bill C.P Ch'ng. APTEC, which MPC will help to manage, will be the sourcing and distribution centre for goods from around the region, particularly from China, India and Asean countries and it is expected to be completed within four years. The township of LakeHill meanwhile is expected to be ready in eight years. "We are in the final stage of getting clearance from the authorities," he said. The company, he said recently signed a memoranda of understanding with its Thai partners. "More announcements on joint-ventures will be made next year," he told reporters after the company's annual general meeting here On Tuesday. The company is also in talks with several government bodies and private international firms from China and Singapore for the joint-venture purposes. SINGAPORE: The serviced apartment market in Asia is ready for a franchise model, according to Quest, a player in the service apartment industry in the Australasian region. Company Chairman Paul Constantinou said while there were several companies offering service apartments in the Asian region, none operated on a franchised system. Quest, with properties in Australia, New Zealand and Fiji, is looking to enter the Asian regional market in the near future. "It's an opportunity for Quest to look at Asia. We believe that the franchise model would be quite successful throughout Asia," Constantinou said in a statement issued here Tuesday. He said with wealth accumulating in many Asian countries there was a growing number of people who wanted to go into the service apartment business for themselves. "There has been an emergence of financially capable people who are risk averse but want to get into business and a franchise would be a great opportunity for them. "The benefits of franchising is that the person who owns the business, runs the business, and there is certainty of income for the developer. Developers want the surety of income over extended periods of time," he added. Constantinou said the service apartment industry was set for growth in the Asian market and longer-stay travellers and business travellers were already being identified as potential customers. "If you're in Singapore for business for an extended period of time, you'd probably prefer to stay in an apartment,(and) as long as you have a place to work, you don't need a palace," he said. KUALA LUMPUR: Property developer Mah Sing Group Bhd plans to explore other potential investment opportunities in Jiangsu, China. The company had already signed a letter of intent in early December to develop a mixed property development project in Wujin district, Changzhou, Jiangsu province. "The investment in Wujin, Jiangsu, is an integral step to the crystallisation of Mah Sing's vision of establishing a global footprint and the group intends to develop an iconic project in Wujin," the company said in a statement. Mah Sing's intention to explore other opportunities in Jiangsu was expressed by its group managing director, Tan Sri Leong Hoy Kum, to Jiangsu Party Secretary Liang Bao Hua during a meeting here Tuesday. Present was DanLong president Xue Yong Zhe. According to the statement, Liang warmly welcomed Mah Sing's entry into Wujin and suggested the group to not only develop residential projects but also commercial projects including offices, and projects to support the logistics and services industry such as hotels. When the Finance Minister introduced Budget 2010 in October, he surprised many and disappointed some with his tax measures. Those who were expecting an announcement on a firm date for the implementation of the goods & services tax (GST) were disappointed that the Government has deferred a decision pending further studies on aspects of the tax. The reintroduction of the real property gains tax (RPGT) came as a surprise to many as it is barely three years since the exemption from the tax was announced. This is a relatively short time-frame in the context of a structural change in a country’s tax laws. However, we are not in normal times what with the economy still in recovery mode and the Government seeking new ways to reduce its budgetary deficit position. Both the GST and RPGT are intended to be revenue-generating measures; particularly the GST, which will be broad-based, affecting a significant segment of the community. It is this feature which makes the tax efficient as it is expected to raise sizeable tax revenue; the very feature which also makes the decision to impose it difficult. On the other hand, the re-imposed RPGT at a flat rate of 5% is unlikely to result in much tax being collected and there has been speculation that it will not end there and, before long, we will see the scale rates under the previous regime brought back. These rates applied at 30% to a sale of a property if held for less than two years with a drop in the tax rate for every year longer the property was held. A property, which was held by an individual for more than five years, was taxed at zero rate. The tax is now 5% regardless of the holding period. The RPGT is a capital gains tax and it will be useful to understand the characteristics of this form of tax and what other countries are doing in this area. The RPGT, like all capital gains tax, differs from almost all other forms of taxation in that it is a voluntary tax. Since the tax is paid only when the property is sold, one can legally avoid paying the tax by holding on to the property. This phenomenon is known as the “lock-in-effect”. This effect is likely to come into play if the tax is set at a high rate. This can represent a deliberate policy measure to dampen excessive property speculation. In fact, the RPGT – which we have today – had its birth in this country as the Land Speculation Tax Act, introduced at a time when real estate speculation was rampant. It is interesting to note that in September, Vietnam introduced a capital gains tax on property transactions. Every time a property changes hands, the tax is either at 25% of the gain or 2% of the transaction value. It has been reported that this new tax has “paralysed” the local property market with transactions being reduced by some 80%. Coincidentally, Malta in its 2010 budget imposed a 12% tax on the transfer value of immovable property with the option of paying tax on the gain at the applicable income tax rate. So our 5% RPGT rate is somewhat benign in comparison although it has not stopped those who have held their properties for a very long time from being hot under the collar. This is due to the inherent unfairness of the tax. Unless the capital gains are indexed for inflation, the seller not only pays tax on the real gain in purchasing power but also on the illusory gain attributable to inflation. The second large inequity of the RPGT, or capital gains tax in general, derive from how economists view it. Land derives its value from the owner’s productive use of it or to sell it to someone who will. The value of this type of asset is the discounted value of the future stream of income from the use of the asset. The “gain” that the seller makes would have been reflected in the asset price paid by the buyer and when the buyer derives income from it, he would be taxed on such income when earned. This is economic double taxation and why many analysts argue that the most equitable rate of tax on capital gains is zero. Going forward, it would seem that any attempt to use the RPGT to collect more tax by increasing the applicable rate, or rates, would need to consider the inherent paradox that this would bring about. A higher rate could deter buyers and sellers from entering into property transactions. This is fine if the intention is to cool down a hot property market. It would then not serve as an effective tax-generating measure. ·Kang Beng Hoe is executive director of Taxand Malaysia Sdn Bhd. KUALA LUMPUR: The standard of entries for the annual International Real Estate Federation (FIABCI) Malaysia Property Award (MPA) has been on a steady rise over the years and choosing a winner has grown increasingly difficult. But it is certainly a good problem to have. Winners of the MPA in their relevant categories will go on to represent Malaysia in the subsequent year at the International Prix d’Excellence. FIABCI-Malaysia honorary treasurer Yeow Thit Sang is optimistic that the winners of this year’s awards, in a ceremony held last month, would do well when they compete with the world’s best at the FIABCI Prix d’Excellence in Bali next year. “We are quite comparable to the rest of the world,” Yeow told StarBiz, adding that the judging panel had a “tough time” distinguishing this year’s MPA winners. “In some instances, it took just half a percentage point to distinguish the winners,” he said. In its effort to continuously raise the standard of the local property industry through its annual awards, FIABCI-Malaysia has been placing great emphasis on the importance of environmental awareness. Initially, the impact of a development on the environment used to account for 10% of the judging criteria for the MPA. Last year, it surged to 25% and at this year’s awards presentation, it rose further to 30%. “We can’t deny that property development destroys the environment. The whole world is doing what it can to reduce carbon emissions and it’s important that Malaysian developers practise this as well,” Yeow said. He added that he was very impressed with the entries for this year’s MPA and the efforts made by the participants to conserve the environment. He cited as an example efforts by UEM Land Bhd in developing Puteri Harbour in Nusajaya, Johor. In line with environmental guidelines, the developer has to ensure silt is filtered before going into the Straits of Johor during excavation. UEM Land invested in a RM15mil double-layer silk screen to ensure the highest standard in preserving the environment. The screen was the first to be used in the country. “They placed the silk screen along the shoreline so that the sea would remain clean, which it was when we visited the site during the judging process,” Yeow said. UEM Land’s Puteri Harbour was the winner of the Master Plan Category at this year’s MPA. In line with the need to promote environmental awareness, a butterfly is moulded on the FIABCI-Malaysia trophies. “Butterflies can detect immediately when there are sudden changes to the environment because they are sensitive creatures. “Likewise, we encourage local developers to be sensitive to the way they impact the environment with their projects,” he said, adding that the image of butterfly has been on the FIABCI-Malaysia trophies for many years. Yeow, who is also the 2010 FIABCI Prix d’Excellence committee president, said there was no doubt that environmental consciousness would play a big role in the judging process at the awards in Bali next year. “We are expecting about 60 entries (at the Prix d’Excellence) next year, which would be evaluated by over 30 judges from various fields,” he said. FIABCI-Malaysia will accept entries for its 2010 MPA from January to March. Malaysian Resources Corp Bhd (MRCB) has made an informal approach to buy or help develop thousands of acres of federal land in the Klang Valley. But its recently-appointed chief executive officer Mohamed Razeek Hussain stressed that no formal bid has been submitted. "We have expressed our interest. It's up to the government to whom it wants to allocate the land," Razeek said in response to whether MRCB had made a bid to the government for prime land in two areas. He was speaking after MRCB's extraordinary general meeting on its proposed rights issue in Kuala Lumpur yesterday. The government recently announced plans to sell or co-develop its prized landbank in Cheras, Kuala Lumpur and Sungai Buloh in Selangor. During Budget 2010, it singled out a 100 acres in Jalan Cochrane near Maluri in Cheras (market rate of RM100-RM150 per sq ft) and 2,000 acres at Rubber Research Institute of Malaysia in Sungai Buloh. The latter land is sited near an industry park in Kota Damansara, with an estimated market rate of RM30 per sq ft.
Razeek said MRCB is keen on increasing its landbank to turn it into mixed development projects. MRCB, he said, is unlikely to make any cash call in the next five years after its proposed renounceable one-for-two rights issue. Shareholders yesterday gave their nod on the exercise that will raise gross proceeds of between RM508 million and RM541 million. "(With money from the rights issue,) we will have sufficient fund to participate in future projects especially in the construction sector. "It also puts us in a good stead to move forward," Razeek said. He added that the company's performance should be better this year and beyond than in 2008 on the back of various ongoing and new projects. Meanwhile, the rights issue at RM1.12 a share will raise MRCB's share capital to between 1.36 billion and 1.44 billion from the present 907.62 million shares. Proceeds will be used to fund expansion into environmental engineering and infrastructure business, acquisition of prime land for property development, as well as for MRCB's 51 per cent equity investment in Nu Sentral Sdn Bhd. The latter company is a joint venture with Pelaburan Hartanah Bhd to acquire and manage a seven-storey retail mall called Nu Sentral at KL Sentral. MRCB said its gearing level will ease to as low as 1.2 times from 2.5 times now after the completion of the rights issue. As at end-September this year, it has total borrowings of RM1.6 billion. KUALA LUMPUR: Malaysian Resources Corp Bhd (MRCB), which has proposed a RM541mil fund-raising exercise via a rights issue, plans to use most of the proceeds to increase its land bank, especially in the Klang Valley. Chief executive officer Mohamed Razeek Hussain said it would invest in land for further commercial and residential developments. “The rights issue constitutes one of the key steps by MRCB to raise funds without incurring interest expenses from banks and a way to strenghten its balance sheet,” he told a briefing after the company’s EGM yesterday. MRCB shareholders approved a 1-for-2 rights issue at RM1.12 a share to raise RM508mil to RM541mil. This represents a discount of about 13.2% from the thereotical ex-rights price of the five-day volume-weighted average market price prior to the price-fixing date on Nov 19. Razeek said the timing was right to gear up for expansion as market conditions globally were recovering from the economic crisis. He said the funds raised were purely for healthy business expansion and not to clear bank borrowings. The rights issue is expected to increase MRCB’s capital from 907.63 million shares currently to between 1.36 billion and 1.44 billion shares. MRCB chief financial officer Chong Chin Ann said the Employees Provident Fund, a 30% equity shareholder of the company, had taken up 130 million rights shares for slightly over RM150mil, while the rest would be backed by banks. The government plans to compulsorily buy a piece of land measuring 0.38ha on Jalan Tun Razak, Kuala Lumpur, from property developer IGB Corp Bhd. The land is near Megan Phileo Promenade and a stone's throw from the Petronas Twin Towers. Should the government pay the prevailing price of around RM1,200 per sq ft for the piece of land, the land may be sold for some RM40 million, a source said. It is understood that the government may build a fire station on that location. "IGB has already received a development order to build 166 units of high-end service apartments with 200,000 sq ft of net saleable area," a source told Business Times. The source added that IGB hopes to get at least RM1,200 per sq ft, given that land prices in vicinity of the Kuala Lumpur City Centre ranges from RM1,900 to RM2,200 per sq ft.
Should IGB be paid RM1,200 per sq ft, it may get some RM40 million from the government. "The project is in the pipeline, but it has not been launched yet," another source said. Citigroup in a research report dated December 16 said that the book cost for the land is RM6.4 million or RM156 per sq ft.
"Typically, compulsory acquisition is done at market price (but what is the market price is also subjective) ... In the property market report, the last transaction in the KLCC area (off Jalan Tun Razak) was close to RM1,500 per sq ft," the report said. It added that should the land be sold at RM1,200 per sq ft, IGB has a potential after tax-gain of RM32 million. EASTERN & Oriental Bhd (E&O) has entered into a sale and purchase agreement to sell a 4,651.203 sq m land together with preliminary works carried out thereon to Hap Seng Consolidated Bhd for RM103 million. The sale is expected to be completed by first quarter of 2010. The plan is for Hap Seng to develop a 35-storey office building with a five-storey basement carpark on the land. As at November 30 2009, E&O’s total bank borrowings stood at RM1.03 billion. Assuming the entire proceeds from the sale were to pare down borrowings, E&O can save RM5.8 million in financing cost based on an average 5.7 per cent interest rate per year. In a statement to Bursa Malaysia Monday, the company said Radiant Kiara Sdn Bhd, a wholly-owned subsidiary of Matrix Promenade Sdn Bhd, which in turn is a wholly-owned subsidiary of E&O, had entered into a sale and purchase agreement with Menara Hap Seng for the sale of the land.